Yaga Venugopal Reddy, better known as Y.V. 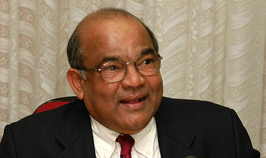 Reddy, was the 21st Governor of the Reserve bank of India from 2003-2008 and the Chairman of the Fourteenth Finance Commission of India from 1st Feb. 2013 to 31st December 2014. Between 2008-13, Reddy has been active in academia, and was associated with University of Hyderabad, Indian Institute of Technology, Madras, and Columbia University, New York. He served as a member of the United Nation’s Commission of Experts on Reforms of the International Monetary and Financial System.